Plants make a great science fair project. They are relatively cheap and provide an endless supply of controls and variables to test. On top of that, understanding the biology of plants is a cornerstone of early science. 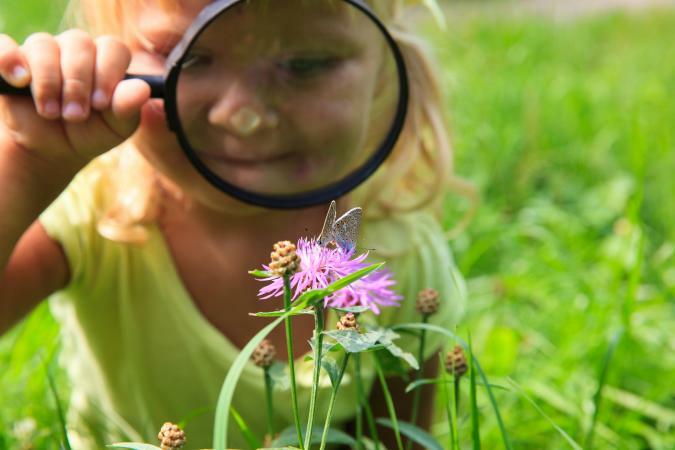 Your budding botanist is sure to love trying her hand at these plant science projects. Venus flytraps are wonderful plants to observe. They are endlessly fascinating and make a unique science fair project that you can be sure no one else will have. In this experiment, students will test a variety of environmental temperatures to see if the venus flytrap has a preferred temperature at which it digests its food. This project takes several months to grow and cultivate the venus flytraps, but will only take about 10 to 15 minutes per day for observation and care. The project is ideal for middle school to high school students. Venus flytrap plants - It's best to get these at a local nursery, however, if that's not an option you can buy venus flytraps from Bug Biting Plants. You will need at least two, but more is always better for running tests. Freeze-dried bloodworms, crickets, or other bugs - You can get bloodworms or live crickets from your local pet store. In order to thrive, a venus flytrap needs an environment that is most closely like its native environment. This means they need light, humidity, non-nutrient soil, and constant water. While the following supplies are optional, they might make your set up more successful. Intelligent plant light or other lighting source - You can buy an intelligent plant light which will help make sure your environment will produce good growing venus flytraps. Grow box - You do not need both a grow box and an intelligent plant light. Tray of water or terrarium - Venus flytraps are native to humid climates. Therefore, they grow best in a place that is humid. To mimic the humidity necessary, set your plant in a tray of water. This should provide sufficient humidity for your plant to thrive. Space heater - These plants also need warmth. If the area you live is especially cold, a space heater can provide some needed help. Likewise, you can set your terrarium in a sunny window. Tip: It's important to note that venus flytraps are dormant in the winter. While you can grow them year round, doing so will decrease the longevity of your plant. Consequently, it's important to plan your project accordingly. 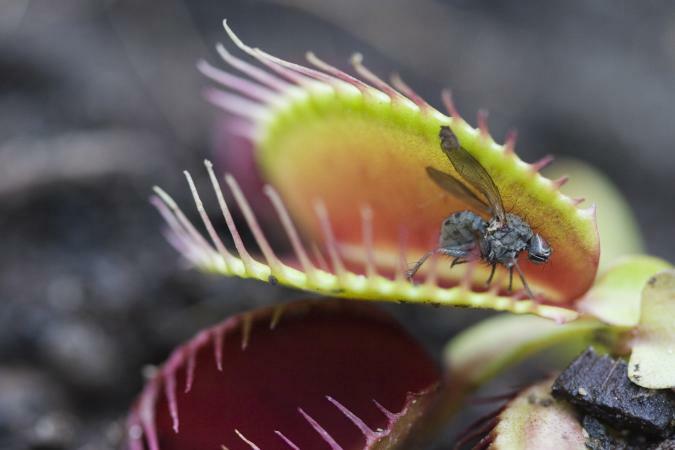 The video below provides some expert care tips on how to best set up your flytraps. After the environment is set up, and you are sure your venus flytraps are growing well, you can begin to test temperature and your venus flytrap's closing and digesting rate. You are going to measure two things. First, you'll measure how long it takes the venus flytrap's leaf to close fully around the food. Secondly, you'll want to measure how long it takes for the 'leaf' to open again. Start by recording the temperature in the room. The first test you do should be at the ideal temperature which is around 75 to 80 degrees Fahrenheit. This is your control group. Every time you feed your venus flytrap, use your stopwatch to record how long it takes the 'traps' to close. This initial phase is your control and should take at least a full three weeks. You'll also want to note the date you fed your venus flytrap, and the date that the leaves reopen. Next move your traps into a colder temperature, approximately 70 to 75 degrees Fahrenheit. Repeat the steps above with feeding and recording the results. Do this for three weeks or longer. Finally, move your venus flytraps to a warmer temperature, approximately 85-90 degrees. Repeat the steps above with feeding and recording the results. For your results to be valid, make sure that you are providing consistent amounts of water and the same type and amount of food every time you feed the plant. 3-15 78° F 5 sec Venus flytrap looks healthy with six 'traps'. 3-22 77° F 6 sec Venus flytrap reopened today. Is there an ideal temperature in which to keep venus flytraps? At what temperature did they close the most quickly? What temperature seemed to slow them down? Do you see one as being advantageous over another? Does temperature affect how long it takes for the leaves to open back up again after digesting an insect? 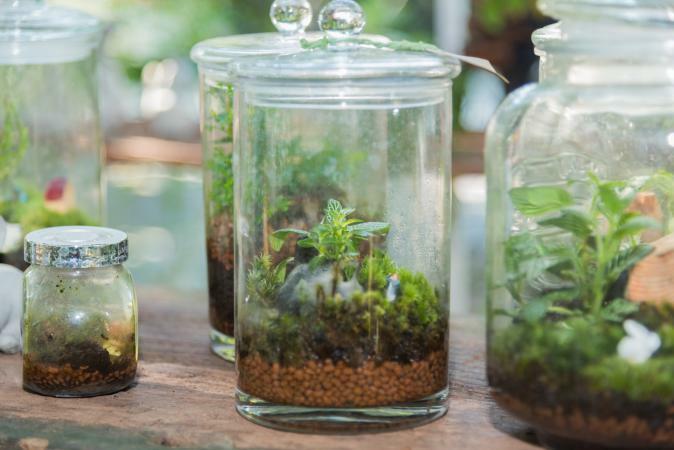 A terrarium is like a little ecosystem in a jar. This is a fun project, and with adult help, works for fairly young children. If you want to turn it more into a serious science project, get out your camera, and record the changes as you go along. Setting up a terrarium only takes about an hour. Clean and dry glass bottle or jar with a lid. Make sure that if this is a recycled jar that used to have food in it that you rinse it thoroughly. While it will be easier if you use a large jar with a wide mouth, any jar with a lid will do. Fill the bottom of the bottle with pebbles. You want to cover at least the entire bottom of the jar with pebbles, but no more than one-fifth of the jar. Next, you'll want to cover the pebbles with a thin layer of activated charcoal. You can usually pick up charcoal at your local pet supply store. The charcoal layer serves to filter your terrarium and keep it clean. Add a layer of peat moss and a layer of potting soil. How much to add depends on the size of your jar. Keep in mind that you want enough peat moss and soil for your plants to grow, but you also need to make sure that your plants have room at the top to grow! A good rule of thumb is about a half-inch of peat moss and a half-inch of soil - but you may need to add more if your jar is very large. You can get peat moss and potting soil at any home supply or garden supply store. Gather moss from outside. Look for it in places where a little sunlight shines. You can collect it in a plastic bag, or just collect it right before you're ready to put it in your terrarium. Gently place the moss on top of the soil. If the mouth of your jar is small, use tweezers or chopsticks to place it in the bottle. Once you have it where you like it, spray a little water on the moss. You can buy plants for your terrarium or you can gather plants from outside. If you buy plants consider choosing plants that are brightly colored to add visual interest to your terrarium. However, you also need to be careful to consider how much light you'll be able to provide for your terrarium, choosing plants that prefer similar conditions to the light you have available. Make sure about two-thirds of the jar is empty space. Finally, clean the glass on the side so that the terrarium is easy to look into. Seal the terrarium with your lid and place it in a sunny spot. Terrariums shouldn't need a lot of upkeep, but if it looks dry, add some water. Likewise, if it looks too wet, take the lid off to let it dry out. Keep a log book and note the changes that you see, or better yet, photograph the terrarium! Do Plants Grow Faster With Caffeine? In humans, caffeine stimulates the central nervous system, but what effect does it have on plants? In this experiment, students see whether or not caffeine stimulates or stunts the growth of mung beans. This experiment takes several weeks to allow the seeds to germinate and observe their growth. It is suitable for elementary aged students. Take your packet and divide the mung beans into three equal piles. Plant an equal amount of mung beans in each pot. To do this, you'll need to fill each pot with soil, and press the mung beans down into the soil about a half-inch. To begin, water the plants with 100mL of water, and allow the seeds to germinate. You should start to see tiny sprouts at the end of the first five to seven days. Measure the height of each plant in each pot. Find the average height of plant per pot. Water the plant labeled 'water' with 100mL of tap water. Measure the height of each plant and calculate the average height for each pot. For week three and four, repeat the procedure watering each pot according to its label. Make sure to take the average measurement at the end of each week. How much caffeine is too much caffeine? Try the experiment again, only this time one pot receives water, one pot receives 10g of caffeine in a 100mL solution, and the third pot receives 20g of caffeine in a 100mL solution. Which works better - adding coffee grounds directly to the soil or watering the soil with coffee? 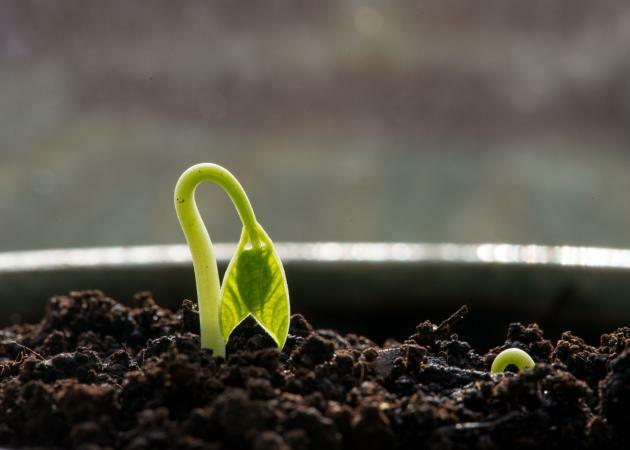 The most important thing to remember when you experiment with plants is that they take a while to grow, and they have to be observed frequently in order to get good results. This is not a project you can pull off at the last minute. With that said, it is a great project to do to learn more about how the world around you works!